Woks have become a popular tool in American kitchens. 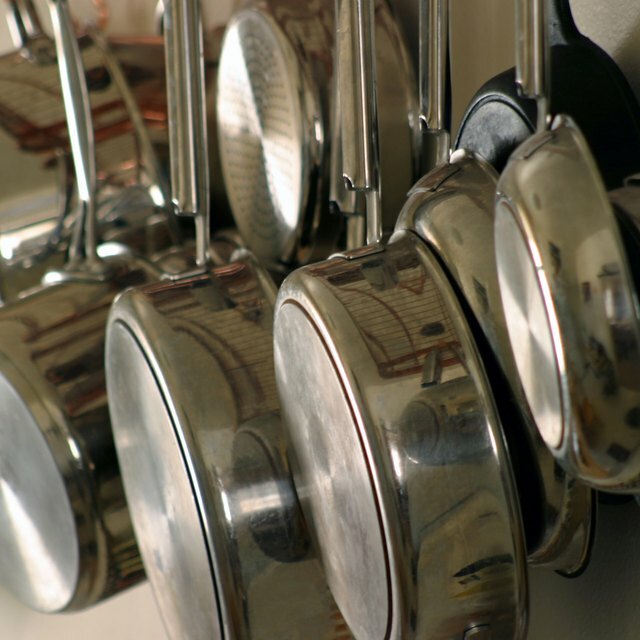 Home cooks are looking for ways to cook healthier meals and experiment with more exotic recipes, and woks give them access to stir-frys and Chinese cuisine. Woks can be used for all types of cuisine, though, and are worth having around for any dish that you need to braise, steam, deep fry or stir-fry. Woks are widely available in most department and kitchen/cooking supply stores and are just as affordable as other cookware. Wash a new wok with soap and water, then dry thoroughly. Heat your wok over medium heat until it is very hot. When you drip some water into the wok, the water should bead up and dance across the bottom of the wok for a few seconds before completely dissipating. If it's too hot, take it off the heat, and allow it to cool slightly. Coat the entire inside of the wok with oil while it is still on the heat. Pour 1 to 2 tbsp. of oil into the wok, and brush or wipe it around the entire inside of the wok. Use oil with a high smoking point, such as palm or peanut oil. Allow the oil to cook to the wok's surface. Each time you do this, you will create a more stick-resistant surface. Allow the wok to cool before storing. Heat your wok over medium to medium-high heat until it is very hot, as described in Step 1 of the previous section. Add cooking oil as soon as the wok is hot enough. Allow your oil to heat up for about 30 seconds. If you are deep-frying, pour in 2 to 3 inches or more of oil and allow its temperature to rise to 350 to 375 degrees F.
Cook your ingredients in the hot oil. Cook any meat ingredients first because they will take longer to cook than your vegetables, which should still be crisp when they're finished. If you are stir-frying a large portion, cook the ingredients in batches. Stir the ingredients so they cook evenly, then move them to a serving dish. If you're deep-frying, use your wire skimmer, also known as a spider, to flip your ingredients over in the hot oil and to remove the completely cooked food from the oil. Steam your ingredients by placing them in your bamboo steamer and placing the cover on the steamer. Put enough water into the wok to come within 1 inch of the steamer's bottom food level. Bring the water to a simmer, and place your bamboo steamer directly into the wok. Remove the steamer from the wok as soon as your food is cooked. Allow your wok to cool and wipe out any leftover crumbs with a clean cloth or paper towel. Safely discard of any oil you may have used for deep frying. Never use soap on your wok because soap will destroy the wok's seasoning, and it will no longer be non-stick. Rinse your wok under hot water and wipe it out with a non-abrasive sponge. Use a brush with sturdy bristles if you have difficulty removing food from the wok. You can buy special wok brushes for this task. If the brush still doesn't work or you do not have one, pour some salt, preferably kosher salt, into the wok, and rub it into the stuck-on food with a paper towel or cloth until the food is scrubbed off. Then, rinse the wok under hot water and wipe it dry with a cloth. 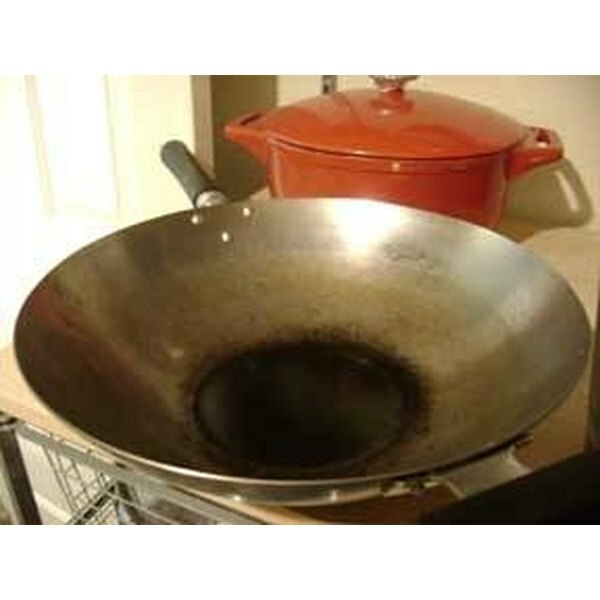 Dry your wok completely before storing, especially if it is not rust-resistant. You can dry it on the stove over medium heat, then let it cool completely before putting it away. If you accidentally wash your wok with soap, season it again before using. If your wok rusts, scrub the rust away with iron wool, wash the wok thoroughly with soap and hot water and season the wok again. Your entire wok will get very hot over the stove. That's a good sign, but because woks can be heavy and awkward, be especially careful when handling them. Is Cooking in a Conventional Oven Healthy? How Long Can Chinese Food Sit Out Before it Spoils?